The Wimberley Retreat - 5 bedroom/5 bathroom riverfront property with a pool on 10 private acres. HomeAway/VRBO listing #594553. Casa Grande on the Blanco @ Shade Ranch (http://www.shaderanch.com) sits on a bluff overlooking the Blanco River on an historic, tree-covered, 25-acre property offering tranquility and seclusion and 513 feet of private river access–all within the Wimberley city limits! The riverfront offers a deep swimming hole (4+ feet) that is great during both normal and drought times. Casa Grande offers over 2,800 square feet of space for family entertainment. While the home is a traditional hill country stone house, it has been upgraded with granite counters, brushed concrete flooring, modern bathroom fixtures and other upgrades. With two large living areas and three dining areas (2 indoor and 1 outdoor), Casa Grande is perfect for family or large group gatherings. One living area is the extraordinary 'River Room.' Stunning views of the Blanco River below beckon from three walls of windows. Open the windows and enjoy the sounds of the river rapids. The second living area is a club-like setting wrought from the original cabin.The spacious master suite includes a king size bed, a comfortable sitting area, television, and a private bath. Relax and Enjoy the Property: Located just off the River Room, you will find a wonderful, large outdoor hot tub. It is a private place to unwind while admiring the brilliant stars above and the murmuring headwaters of the Upper Blanco River below. Follow the limestone steps near the hot tub down to the 513 feet of private river access below. The river will invite you to swim or wade in its cool waters and leave all worries behind. Or grab your fishing rod! Fly Fishing magazine identifies the Upper Blanco River areas as '. . . one of the best fly fishing spots in Texas.' Bring your kayak or canoe, and don't forget the floats and water shoes for tubing down the rapids. There’s plenty of room along the river to enjoy a picnic lunch, an afternoon nap or book, or a gorgeous sunrise or sunset on the banks of the Blanco River. Located only 5 minutes from Wimberley Square, this home completes the perfect hill-country getaway without sacrificing any of the charm (or shopping opportunities) that Wimberley has to offer. Enjoy the grounds: The twenty-five acres of grass and woods provide ample space to run, throw a ball or frisbee, play kickball or softball, hike in the woods, or chase lizards, frogs and fish. Sit out on the flagstone patio overlooking the river and grill out burgers on the Weber grill. Grab a cool drink and play a game of Bocce Ball or horseshoes on the court with the family. After the sun goes down you can also enjoy the fire pit to cook marshmallows or warm up on a cool fall or winter Hill Country evening. Watch for the many deer who live on the property, especially in the early morning. Friendly ducks from the river often visit at the house as well. Casa Grande at Shade Ranch is perfect for groups of all kinds. The kitchen is equipped with all appliances, extensive food and drink preparation and serving ware, and indoor/outdoor dishes to accommodate any large meal. The children’s nook area provides age appropriate movies, books, videos, puzzles, games and toys for hours of entertainment and an opportunity for the adults to visit in the other common areas. Movies and books and games for adults are also provided, as is a cable TV/DVD player and music system. Whether you are planning a ladies getaway trip, couples gathering, team-building session for a small group, multi-generation family get together, a mini-reunion, a crafts or outlet shopping or winery tour, or celebrating a special birthday or milestone, Shade Ranch will provide all of the privacy, space, and amenities your group will need. Little House on the Blanco @ Shade Ranch: We also have a one bedroom/one bathroom house on the same 25 acres that is available for rent if you have a larger group that would like additional room. The two houses are completely separate and don't share anything other than the acreage. They sit approximately 100 yards apart and each house has its own patio, hot tub, grill, fire pit, etc. Shade Ranch in Wimberley Texas is a perfect location for us because it is 3 hours from Houston door to door and only 1 hour from the Austin or San Antonio airport. Our parents and extended family and friends often join us for vacations at Shade Ranch. With beds for 10 and two large indoor family gathering rooms at Casa Grande, we have room for many to reunite under one roof. We appreciate the seclusion of the 25 acres while making full use of the conveniences of the Village of Wimberley. We regularly utilize the nearby groceries, pharmacies, restaurants, wineries, hardware and other stores. We appreciate the many nearby state parks and towns that make up the Texas Hill Country! Casa Grande is unique in that it literally sits on a bluff overlooking the crystal clear Blanco River. Sitting in the River Room (our second den) you look out over an unobstructed view of the river and huge cypress trees just below and across the house. There are many beautiful stretches of the river, but it's hard to beat our stretch where you have a deep swimming area as well as a shallow rock shelf for lounging or for kids to play on. The most obvious benefit of Shade Ranch is the beautiful, cold and clear Blanco River. One swim and you too will be sold as it is cool even in the dog days of August, and never crowded. The shallow area suits those wanting to wade or to sit and enjoy the flow of the river and also serves as entry to the adjacent deep swimming area. We think it is perfect and the kids do too. They and their cousins and friends can't get enough of the river when we are there. The river bank area is so spacious, and the sound of the river is so peaceful, it is our favorite place to picnic or enjoy a glass of wine. The kids also like to play games and sports in the grass along the river. They also enjoy fishing, climbing to the 'cave' by the river under the ledge, looking for arrowheads after a rain, having a family 'sleepover', and just exploring the 25 acres of 'forest'. We know you will find these wonders and more at Shade Ranch. toilet, combination tub/shower, tub, shower, Granite counters and Kohler fixtures. We are 1.5 miles from the Wimberley Square along with its great shops, restaurants and parks to enjoy. Shade Ranch is located in the city limits of Wimberley, but you feel that you're in the woods of the Texas Hill Country. Take in the view of the Blanco River from our River Room den area or from the stone patio while cooking on the Weber grill. All sheets and towels provided for your stay. Washing machine available for use. Please bring your own detergent. Dryer available for your use. Bath towels, hand towels and wash clothes provided. Bring your own river towels for use at the river. Modem in main den area. Two dens or living rooms with lots of seating for family and friend gatherings. Two refrigerators available for all your needs. One is located in the laundry room. Large pot coffee maker, coffee, creamer and sugar provided. Basic spices, Pam, Ziploc bags, etc. provided for use. Full supply of plates, bowls, glasses, etc. available for use. Dining area seats 8 and sits in the River Room with views out to the Blanco River. There is also a breakfast nearby next to the kitchen with seating for 4. Additional seating outside on the patio. Flat screen with DVD player in main den. Flat screen in master bedroom. Third TV in bunk bed area that is great for kids to watch videos in the River Room. One in den and one on kids' TV. Large collection of books for both adults and children provided in the River Room and in the master bedroom. Variety of board games provided in the River Room. Large collection of toys provided in the River Room for kids to enjoy. Lots of kid videos and others the parents will enjoy as well. 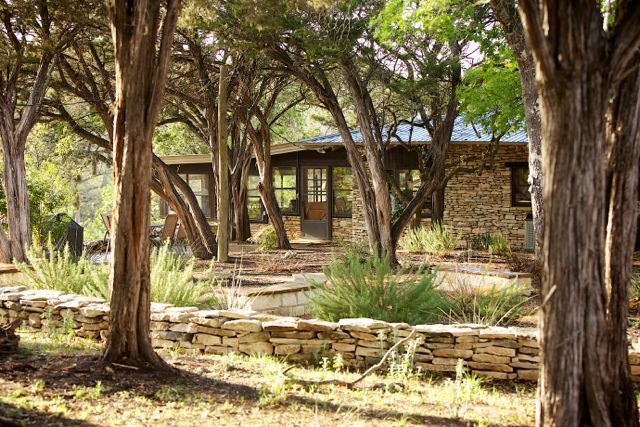 Expansive garden area around the house with native TX hill country plants. 25 private acres to explore as you wish. River is great for kayaking and canoeing for guests that wish to bring their own. Flagstone deck with table and chairs, bocce ball court, horseshoes and fire pit. Water toys such as tubes, noodles and rafts provided for guests' use. Supply comes and goes based on what guests leave behind or take. Private hot tub just outside of River Room overlooking the Blanco river. Hot tub is treated twice each week. •	Granite countertops, stainless appliances, concrete flooring, leather furniture, etc. o	2 large dens (one with primary TV and other is the large “River Room” with wrap around windows and views of river) o	Wood burning fireplace in den o	3 Bedrooms: Master suite with king bed, guest rooms with queen bed, and 2 twin beds o	River Room has sleeping area with bunk beds and day bed with trundle. o	Pack'n Play available upon request o	2 full baths with hair dryer, toiletries, shampoo & liquid soap provided o	Ample supply of towels & linens o	Breakfast area table with 4 chairs o	Dining area table with 8 chairs o	High chair o	Kitchen fully equipped with dishes and cookware o	Full size refrigerator w/ freezer, microwave, electric stove & oven, dishwasher o	Coffee maker (with coffee, creamer and sugar), electric blender, filtered water o	Wood burning fireplace	o	2 TV's with HD DirecTV DVD and DVR o	iPod player with AM/FM; Telephone w/ US long dist. This is a great place for family fun! There is something wonderful for all ages. The town has plenty to offer for restaurants and fun shops and art. Great place to get away from the noise, hustle, and bustle of the city and enjoy God’s creation. We greatly enjoyed the inside and the outside living spaces - fire pit, grill, hot tub, bocce ball, walking on the road to the house and in the woods, and of course, the river. We went up and down river on our kayaks. We’ll have to come back to swim, as the weather was a little cool. Our stay here has been wonderful. You have had everything we needed for the 3 families to come together. Ages ranging from 5 to 75. Our children who live here enjoyed the opportunity to get away, but still be close to jobs and schools. Those visiting from out of state loved the hill country experience. We were lucky to have great weather most days, but the one day it was bad, there was plenty to do inside. Thank you so much for providing this for us. Your entertainment sources, books, games, etc were phenomenal. The kitchen had everything we needed to prepare our meals. Outside amenities were great. We cooked meals and enjoyed our s’mores on the fire pit. We will be recommending Casa Grande and hope to return. The house has an amazing location next to a beautiful part of the river. It’s very secluded as well. This home is large, clean, and comfortable. Everything is just as advertised. We enjoyed our stay and will likely do so again. Cancellation Policy: Please note that VRBO/HomeAway system uses a boiler plate refund policy. Our policy is that you receive a full refund, less a $100 re-booking fee, if you cancel more than 30 days in advance. If you cancel less than 30 days before your arrival date, you will be refunded (less the $100 re-booking fee) if we are able to re-book the same dates as your stay. This policy overrides the HomeAway stated policy. Pets: Sorry, no pets are allowed. Damage Deposit: Your damage deposit will be refunded one week after your departure if the following conditions are met: 1) no damages are made to the property, house or furniture; 2) the house is left in an orderly fashion and not in need of additional cleaning due to excessive trash or messes; and 3) neighbors or guests at the other house were not disturbed during your stay where complaints were made. We will not hold your deposit hostage, we just want people to be considerate guests.